Harold Ellis Sackett, son of Herman Eugene Sackett and Celinda Esther Greene, was born in New York StateG on 17 October 1921.1,2 He died aged 92 on 28 December 20133,4 and was buried at Mountain Valley Cemetery, Hallstead, Susquehanna County, PennsylvaniaG.3 He married in about 1953, Betty ___. Harold served in the US Army Air Corps during the Second World War. Email from Stephen E Sackett to Chris Sackett, June 2014. Website Estey, Munroe & Fahey Funeral Home, Owego, NY (http://www.emfaheyfuneralhome.com/tribute-ajax/…), "Harold Sackett, 92, passed away on Saturday, December 28, 2013. 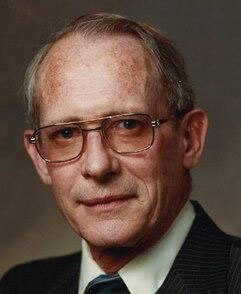 Mr. Sackett was predeceased by his son and daughter-in-law, Michael & Sandy Sackett. He is survived by his wife of 66 years, Betty Sackett; four sons and daughters-in-law, David Sackett, Stephen and Pamela Sackett, Richard and Tamara Sackett, Brian and Kathryn Sackett; two daughters and son-in-law, Kathleen Sackett, Barbara and Michael Gera; several grandchildren and great grandchildren; two brothers, Edwin Sackett, Lester Sackett; sister-in-law, Geraldine Sackett; numerous nieces, nephews and cousins. Harold was a veteran of the U.S. Army Air Corps during WWII. He retired from IBM and was an active member of BPOE Lodge #1039, having served as exalted ruler from 1979 to 1980. Funeral services will be held on Friday, January 3, 2014 at 6:00 p.m. at the Estey, Munroe & Fahey Funeral Home, 15 Park St., Owego with the Rev. David C. Seaver, officiating. The family will receive friends Friday from 4:00 to 5:45 p.m. at the funeral home. Memorial contributions may be made in Harold Sackett’s memory to the Owego Fire/Emergency Squad, P.O. Box 22, Owego, NY 13827."